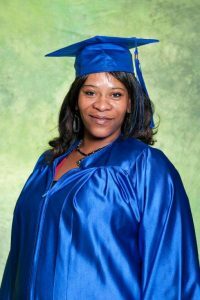 “There is nothing more out there for you right now than school, this is your place,” is what Domita Brown, a graduate of HopeWorks adult education and personal and career development programs, wishes she could say to change the mind of her high school self. Domita became disinterested with school in her early high school years. Rather than focus on her schoolwork, she spent the majority of her time on the streets. She began doing drugs, and often skipped her classes entirely. On the rare event that she attended classes, she would spend her lunch break drinking alcohol just to get through the rest of the day. When she struggled to repeat the 10th grade, she made the choice to drop out of high school. Her life began to spiral deeply out of control, and the next few years of Domita’s life were spent in and out of jail for various minor drug charges. Minor offenses turned into a felony drug charge, and more time spent in jail. Having hit rock bottom, Domita was confronted with a frightening reality. She reached out to her parole officer for help. Domita spent the three years she was on parole in a recovery home named Grace House rebuilding her life and getting clean. Through Grace House she became connected with HopeWorks. Armed with newfound strength and courage, she worked her way through our Adult Education Program and Personal and Career Development Course, which included an internship. Having now earned her high school equivalency diploma, Domita is working while she is enrolled in school. Her ultimate goal is to become a treatment center counselor, offering help and support to men and women whose life circumstances lead them to a dark place that Domita is familiar with. Her story is just one amazing example the impact that hard work, hope and education can make on an individual’s life. We are proud to call Domita one of our distinguished alumna and enjoy watching her continued successes. There are many students now who are truant, making some of the same life choices that Domita made. What’s important to know is that Domita’s words of advice to her younger self are true for all students out there who are considering dropping out of school – school is your place. If you are interested in earning your high school equivalency degree, or need professional and career development training, please reach out to HopeWorks at www.whyhopeworks.org.